At the end of last week, I was two wins away from Master. I began the week drafting Elysian, splashing Shadow for a few removal spells. Unfortunately, I forgot once again to grab a screenshot of the deck. I thought it was a powerful deck, good enough to carry me those two wins. Sadly, I got power-screwed a couple times and finished a frustrating 2-3 to start the week, leaving me now three wins from Master. I mentioned last week that the nerf to Valkyrie Arcanist might make it so that you can’t just draft a pile of them and expect to win. Turns out I was wrong. I opened on a pair Spiritblade Stalkers and an Entrapment. Classic Justice stuff, right where I want to be, even after the nerf. Inquisitor’s Halberd followed, which pushed me into Argenport. My first Arcanist came next, then Challenge by Law. That’s a rare I’ve never played before, but hard removal is never stone unplayable in limited. Omens of the Past was as mediocre as it usually is, giving me only 4 playable cards. The Empty Throne was much kinder, stuffing my deck full of Lethrai Rangers and ways to get them through. The second Dusk Road pack was where things got really juicy. I picked up 2 Arcanists, Entrapment, Tandem Watchwing, Affliction, and Copperhall Marshal. Okay, deep breaths, everything’s fine. My deck is great. I’m just going to keep playing well, and I’ll get the Master rank I deserve. Or my opponent will get stuck on 2 power when I have a Lethrai Ranger. Whew. I finished out this draft and climbed through Master to about rank 60. 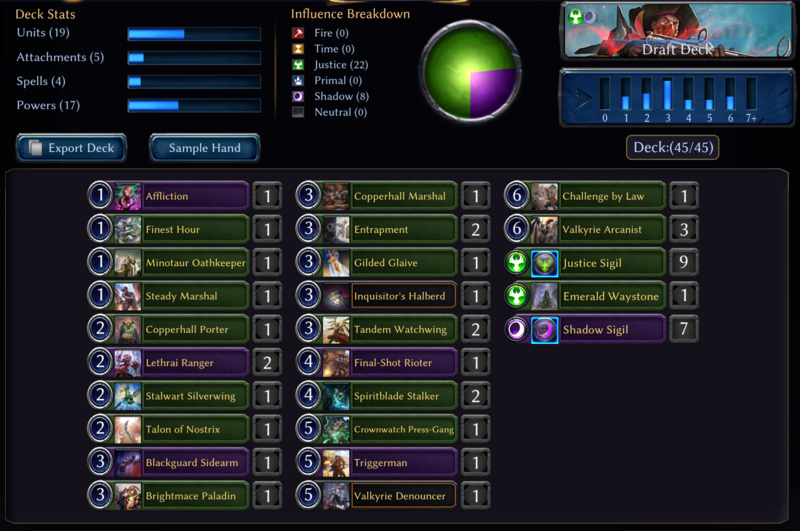 Crownwatch Press-Gang was a little suspect in the deck with only two 1-drops, but I had enough evasion that tutoring for a Minotaur Oathkeeper was a solid play. Challenge by Law proved to be playable, if not amazing. Usually the thing you want to silence is also the thing you want to kill anyway, but there were a few times I used it to kill a big ground-pounder and clear the skies for my valkyries to get there. Arcanist might cost 6 mana now, but she’s still as annoying as ever for the opponent to deal with. And because I had so many flyers, the opponent was often in a Catch-22 position when it came to dealing with her. Riding high off my fresh Master ranking, I started off on Stonescar Sneak. I love this guy. He gives you an incredible amount of late-game inevitability for a very small cost. I followed up with some Vainglory Patrols and random gunslingers, flirting with justice along the way. When I opened Memory Dredger in pack 2, I felt really good. Pack 3 blessed me with Plague, followed by Execute. Nothing could possibly go wrong. Pack 4 was the worst pack I could possibly imagine. I first-picked Vainglory Patrol over nothing else. My second pack had zero shadow cards and no playable time ones. Other than a second, very late Vainglory Patrol, I picked up nothing but extremely mediocre junk like Duskcaller and more Baying Serasaurs than I could ever want. Serasaur is fine when you’ve got some dino synergies to go with it, but I didn’t have any of that. I wound up having to play Subvert as my last card, but I probably should have just played 18 power (since that’s all Subvert ever hits: power). Still, I started off 2-0, peaking at rank 38. Memory Dredger was fantastic, returning all my random 2s that I traded off. Unfortunately, 2 was where the winning stopped, as I started running into players with actual synergistic decks instead of leaning on bombs. After that disappointing finish, I dropped back below 100. I opened a rather unexciting pack, with some middle-of-the-road playables and a Crest of Wisdom. I took the Crest, staying open. You might notice that the Crest isn’t in the final deck, and you’d be right. I must have completely overlooked it in deckbuilding, and then totally forgot I drafted it until I looked at my notes to do this writeup. Whoops. On the bright side, I don’t think I ever flooded out, so it would have probably been only a marginal upgrade. I second-picked Extinguish, then followed up with a Trail Maker over Vainglory Patrol. Took Nocturnal Creeper third out of a very weak pack. Auric Record Keeper came fourth, which is a card that goes later than a 3-power 4/4 with upside should go because Combrei isn’t really a supported tribal archetype. Not much else playable came out of this pack. I took a few mediocre fire cards over nothing, but I wasn’t feeling too good. I opened a foil Crownwatch Press-Gang and a Noble Firemane as the only two notable cards in pack 2. I didn’t feel like fire was really open, so I went with the money draft/higher upside of the foil Press-Gang, even though I didn’t yet have any 1-drops. I took Streetwise Informant over not much, and it began to look like I was going fully three-color in this one. Sleepless Night came third, again over nothing. Highbranch Sentry (aka a vanilla 3/3) followed. 6th pick, I moneydrafted a Champion of Fury because there were, yet again, no playables. Glad to be out of that horror show and back to real cards, I first-picked a Clockroach over Rapid Shot and a Lethrai Ranger. I really didn’t want to be committed to shadow if I didn’t have to be. Unfortunately, I had to take an Amethyst Acolyte second, but I got back on track with Vanquish and a pair of Towering Terrazons. Then I picked up an Awakened Student sandwiched by Safe Returns. I still wasn’t thrilled, but it began to look like there was a decent Combrei-splash-shadow deck lining up. I took a pick-1 Duskwalker in pack 3, not ideal but not unplayable either. Frenzied Omnivore came next, followed by two Frontier Confessors. So that’s how I ended up with this pile. Safe Return was definitely the MVP. Resetting the killer on Frenzied Omnivore won me several matches, as well as protecting a swole Awakened Student from their one way to deal with it. It also did a fantastic job of resetting Frontier Confessors. At 4-1, I ran into a Praxis Sentinel deck with not one, not two, but three Monolith Guardians. I combined Frontier Confessor and both Safe Returns to silence two of them and a Seasoned Spelunker. I dealt with the third by trading a Nocturnal Creeper for it. Sleepless Night was actually pretty good for me. I had enough Nightfall that I was hitting all my power drops. If it looked uncastable, I discarded it to Frenzied Omnivore. It directly won me two games where we had exchanged resources and then I got to draw 8 cards. Unfortunately, I went from 5-1 to 5-3. My last-round opponent comboed off with Sureshot to kill me just before they were about to die. Curse you, Ornamental Daggers! Final Tally: 16-11 (48-28 overall). Not the best week, but not the worst either. It was good enough to get me to Master, where I’m currently hanging around in the 60s. I’ll probably do a few more drafts before the reset, but my time may be devoted to Magic for a bit, starting on Wednesday with the return of Cuuuuuuuuuube! Card of the Week goes to Safe Return. Despite being fairly mediocre in previous formats because it’s such a negative tempo card that doesn’t generate card advantage on its own, the Dusk Road draft format is a lot slower than previous formats. When both players are struggling to assemble synergies, setting yourself back on mana to protect a big threat or generate card advantage isn’t so punishing. Soapbox time: Set 2 should get the hell out of my draft format. I mentioned this last week, but I feel like going into more detail this time. It was already a fairly low-power set compared to Set 1, but Dusk Road rendered half of the already-scant playables useless. Lifeforce and Mentor synergy cards are garbage now, because you can’t draft enough of the pieces around them. 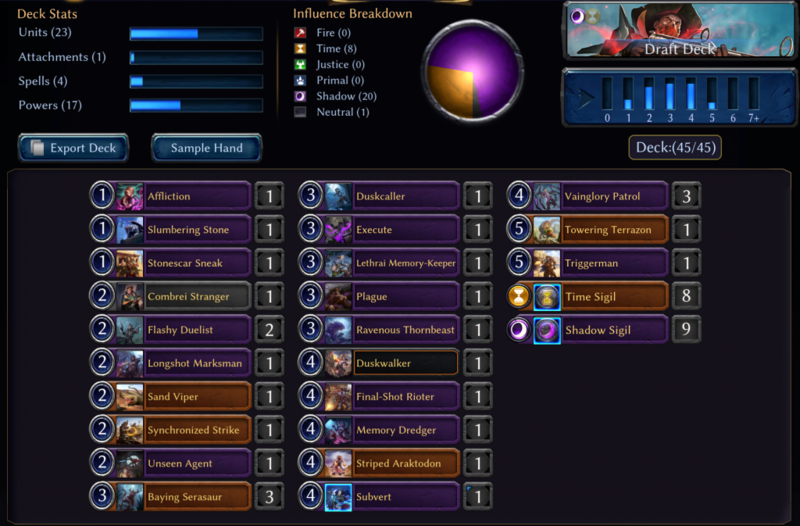 Sure, some of the cards like Roosting Owl, Sparring Partner, Minotaur Oathkeeper, and weapons are just sold cards overall, but stuff like Voyaging Lumen is just a vanilla 5/5 for 6 most of the time. You can’t go deep on Bloodcall Invocations anymore because there aren’t enough lifegain cards to make it consistent. Many of the Xenan commons, in particular, were devoted to the Lifeforce deck, which can’t really exist in the Dusk Road format. There’s one repeatable lifegain effect in the Xenan factions in Dusk Road, and it’s a 1-cost relic that won’t do anything if you don’t have one or two of your payoffs. A lot of the playable-but-mediocre cards lack the right tribes. Nobody wants Unseen or Elementals or Minotaurs or Mystics or Radiants or Centaurs or Warriors or Soldiers or Mages, all of which appear on multiple commons/uncommons in Omens. Omens has some nice Hooru cards…except that Hooru isn’t really supported in Dusk Road, so you’re unlikely to be prepared to take advantage of things like Aerialist Trainer or Shelterwing Rider with their demanding influence requirements. What about Skycrag, though? That was a supported faction in Omens, and we’ve got Yeti tribal in Dusk Road! One problem…Skycrag in Omens has exactly 4 Yetis, one of them rare. None of them are real payoffs for being the Yeti deck. Sure, you can pick up some Mortars if you’re lucky enough to have them opened in your pod, but you’re not going to get much tribal help here. Fire doesn’t even have a single yeti. Praxis in Dusk Road wants you to have Sentinels and Explorers and Relics. Praxis in Omens has…three explorers at common, but only one is really a card worth playing unless you have serious payoffs. In my opinion, Praxis is the biggest offender because some of these cards could easily have been explorers. Excavation Assistant barely has a reason to exist as-is. Couldn’t we at least have made it into an explorer instead of a machine? It has three mages at common or uncommon. Two of the lifeforce cards are a cultist and a mystic, but could we not have found a way to make them flavorfully explorers? I’m not saying these should all have been explorers, but it would be nice to have a least a few of them. Amber Ring is the best card for the Sentinel deck here, but it’s uncommon and you may not ever even see one. Fire in Omens is straight-up worthless for the Praxis deck. Not a single explorer OR sentinel OR playable relic. Argenport does a little better. Even though its multicolor common, Auric Bully, fails the tribe test, it’s a very playable 2-drop that synergizes with a universal mechanic, weapons. Shadow is not very deep because of the aforementioned lifeforce problem. Justice has a million playable units, but so many are soldiers or minotaurs or unseen that it’s tough to make synergies come together. There are a few valkyries, and one random gunslinger (why just one???) at uncommon in Minotaur Duelist. Stonepoweder Alchemist is also a gunslinger, but requires a full Argenport commitment. 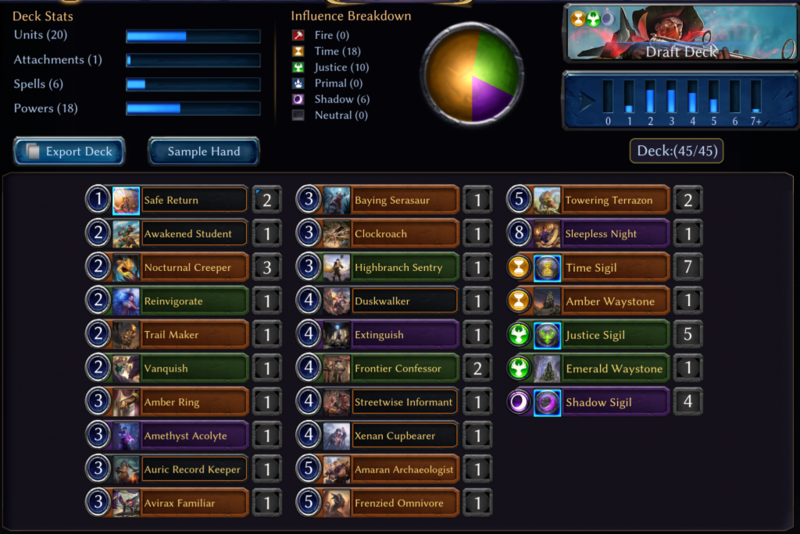 Argenport gets by because it has decent weapons and pump spells that are always decent things to have in draft, not because it’s actually at all synergistic with Dusk Road themes. Another thing to note is the density of Justice cards that remain playable out of Omens. The recent balance changes have been aimed at taking Justice down a peg, and rightly so. In my opinion, this is because Justice has so many generically-playable cards out of Omens of the Past. When other decks are drafting effectively three packs and Justice is drafting four, of course it’s going to be dominant. Instead of fixing the cross-set synergies, they’ve just nerfed Justice cards twice. Honestly? I still think Justice is the best faction because you’re just less likely to draw blanks in one-fourth of your draft. I feel like, outside of bomb rares, pack 2 has added little, if anything to my deck in any of the Dusk Road drafts I’ve done. Why is it here? What’s wrong with 3-1-3-1? If you’re concerned about new players building their collections, bump the Omens of the Past drop rate from gold chests. Pay out 2:1 Omens:Empty Throne. Or, instead of just tweaking things in Dusk Road, buff some of the unplayable commons in Omens. These draft reports are bleeping amazing. This is exactly the extra content I want from eternal. Talking about synergies I would not have thought of and outlining drafts in a written format is what I wanted. Also, letting us know that sometimes it really doesn’t come together even for someone who has a lot of experience and is way higher rated in draft was a big boost. Good analysis, keep it up!